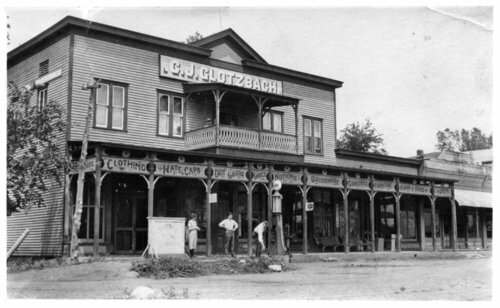 Three photographs showing interior and exterior views of the C. J. Glotzbach Store on Newbury Avenue in Paxico, Kansas. Owner Carl Glotzbach moved to Kansas from Indiana in 1870 and farmed near Paxico before purchasing the store from the Bolton brothers. People inside the store are identified as Carl Glotzbach, Ben Glotzbach, Isadore Glotzbach, and Magdalene Rosenstingle.